It's time for another 18 for 2018 update! In July, I said I didn't know if I would make any progress in August. I am happy to report that I did, indeed, make some small progress. In August, I ordered Christmas cards (because ten of them were free, and another six of them got my Shutterfly order up high enough to get free shipping), so 16 of you get Christmas cards (you will note, I did not specify how many or when these cards would be sent). 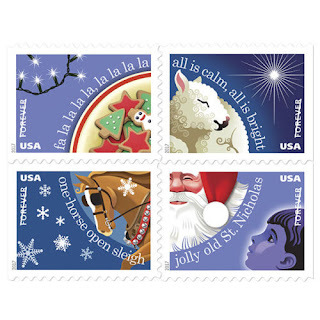 I also got some Christmas postage stamps, because there was a deal. And I found the envelopes I saved from last year's Christmas cards so I know who to send cards to this year. So that goal is well in hand. And that's all. Still working on the paper and the household binder. And I feel like I have to wait until at least October to send Christmas cards. Obtain and begin using a to-do notebook--this has already been so useful! I have a running to-do list now, instead of having to start fresh every day. It's a lot more difficult to misplace than a random piece of paper. ** Purge file cabinet and create paper organization system--Ugh! We have so.much.paper. Half of me wants to get rid of it all. The other half is afraid I'll shred something we'll need later. ** Create a household binder/legacy box--I think my boys would be lost if something happened to me. Delete saved electronic mystery shop screen shots and receipts--yep, I've got every screen shot and almost every receipt from every mystery shop I've done in the past four years. It's a lot. ** Buy desk task light--I've already tried once this year, but I didn't like it, so I need to try again. Buy phone charging cords for each of our vehicles--I told Hubby I was going to do this, and he was like, but we have charging cords in all the vehicles, don't we? Well, yes, we do...for his phone, but not for AKD's and mine. Make a chicken sign--It's going to have the silhouette of a chicken, and say something along the lines of, "Danger: Dinosaur Area." Take a class through community education or a local craft store--I used to do this fairly often, but somewhere along the line, I stopped. ** Finish valances for master bedroom. I've only had the material for...3 years? 4? A long time. ** Get the boys' picture taken--the place I used to take them to closed, so I need to find a new photographer.